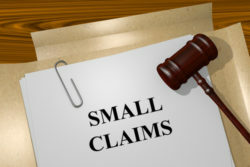 Small claims court is a more unique, simple court, for those looking to file for smaller claims. Personal injury claims, for example, are cases that are normally dealt with in a larger court, as there are large amounts of money at stake, in addition to lawyers and their fees. Small claims court, on the other hand, is typically for cases under $5,000, and attorneys are not allowed. So, when is it a good option to choose a small claims court? This is another common case. Say you buy an appliance that costs you $3,000, but as soon as you go to use it, it simply does not work. At this point, you go to the supplier, expecting them to replace it, or possibly even refund you. However, they feel otherwise and refuse to help you. This is a great time to take it to a small claims court. Again, the maximum claim is $5,000 in a small claims court. If your claim is larger than that, it must be taken to a larger court. If this is the case, let Stoloff Law help. We will fight for your compensation, and get you what you deserve. Contact our offices today to schedule a consultation.